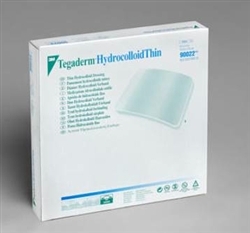 3M Tagaderm Hydrocolloid Thin Dressing is a sterile wound dressing that consists of a hydrocolloid adhesive with an outer layer adhesive cover film that in impermeable to liquids, bacteria and viruses. The dressing maintains a moist wound environment for enhanced healing. The Outer film is 3M Tegaderm Transparent Film Dressing technology which applies easily and eliminates need for taping edges, is easy to clean, minimizes exudate leakage and is impermeable to liquids, bacteria and viruses. Tagaderm Hydrocolloid Thin Dressings may be worn up to 7 days. They are conformable and are easy to apply. For minimally draining wounds - Laboratory testing has proven Tegaderm and Tegaderm HP dressings provide a viral (HIV-1 and HBV) barrier while the dressings remain intact without leakage.